St. Patrick window at St. Benin’s Church, Ireland. St. Patrick is one of a handful of Christian saints, along with Mary, Valentine and Francis, that is celebrated in popular culture. His feast day is commemorated with supermarket meat sales, green rivers, green beer, and (my favorite) parades. But who was the real St. Patrick? 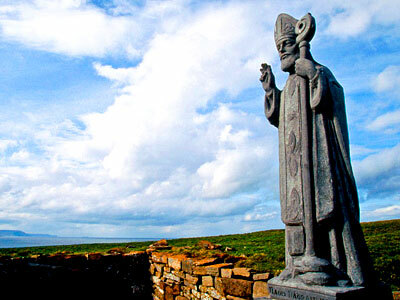 Most people know that the missionary Patrick (Patricius or Pádraig) helped to bring Christianity to Ireland in the 5th Century. Some may remember how his first visit to the island was as a slave. Sadly, only a few may remember Patrick’s opposition to structural injustice and his prophetic defense of victims of violence and human trafficking. As with so many of our saints, Patrick’s radical application of the Gospel has been domesticated and stripped of its challenging message. Rather than witnessing to the prophetic and loving call of the God’s mission, Patrick has been turned into a caricature to decorate commercial marketing schemes and Hallmark cards. Patrick’s deep desire to combat injustice and evil forces is most clearly evident in one of the few original texts written by the man. 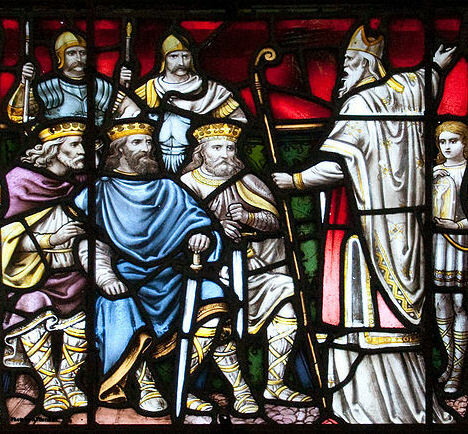 In his open Letter to the Soldiers of Coroticus, Patrick publicly denounces Coroticus, a warlord (and possibly king) from his British homeland, because of his practice of taking Irish slaves. “I don’t know which is the cause of the greatest grief for me: whether those who were slain, or those who were captured, or those whom the devil so deeply ensnared” (4). “Therefore I ask most of all that all the holy and humble of heart should not fawn on such people, nor even share food or drink with them, nor accept their alms, until such time as they make satisfaction to God in severe penance and shedding of tears, and until they set free the men-servants of God and the baptised women servants of Christ, for whom he died and was crucified….” (7). “Who among the holy people would not be horrified to take pleasure or to enjoy a banquet with such people? They have filled their homes with what they stole from dead Christians; they live on what they plundered. These wretched people don’t realise that they offer deadly poison as food to their friends and children” (13). “The Most High does not accept the gifts of evildoers. The one who offers a sacrifice taken from what belongs to the poor is like one who sacrifices a child in the very sight of the child’s father…It would take a long time to discuss or refer one by one, and to gather from the whole law all that is stated about such greed. Avarice is a deadly crime. Do not covet your neighbour’s goods. Do not kill. The murderer can have no part with Christ. Whoever hates a brother is guilty of homicide. Also: Whoever does not love a brother remains in death. How much more guilty is the one who stained his hands in the blood of the children of God” (8-9). 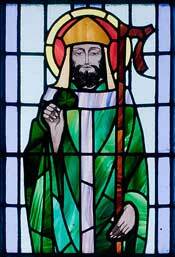 As we celebrate St. Patrick with our parades, green cupcakes, bagpipes, and beer, let’s also remember Patrick the Prophet and the call to stand up for those who are victims of violence and structural greed in the world. Reblogged this on lisa helene donovan bacalski. On St Patrick’s Day, let’s acknowledge him as an activist, who reportedly spoke out against slavery and oppression and other injustices.